The Crimson Moon moves things to the Heian period in Japanese history, and follows new Golden Knight Raikou, Makai Priest (or alchemist according to the Funimation subtitled) Seimei, and Raikou's teenage attendant Kintoki. This first episode sees the three investigate a mysterious Nio statue that comes to life each night, along with a sculptor determined to create the perfect bodhisattva imbued with life. However with the Madou Ring Zaruba turned to stone and Raikou seemingly unable to transform without the assistance of Seimei, there may be more than it seems to this newest incarnation of the legendary knight. 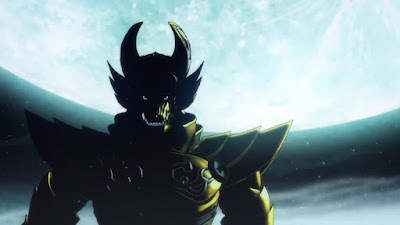 Despite Garo being the title character of this franchise, in this episode Raikou (interestingly voiced by Masei Nakayama, who plays Ryuga in Makai no Hana) felt like something of a side character. There's an element of mystery to this newest iteration of knight, who like his animated predecessor doesn't seem to have the same handle on the Garo abilities his live action counterparts do. The episode also remarks to the lineage of the armour having been lost for a long time, which will very likely play into this. But what do we learn about Raikou himself? Well other than that he's not quite as stern-faced as some of the other people who have held the mantle of Garo, not that much at all. But the situation and his actions in this episode seem to suggest he's quite new to the Makai Knight game, so just like what happened with Leon this series will probably chart his growth into the much more traditional archetype for the character. The real star of this episode was Seimei, the female Makai Priest (voiced by renowned seiyuu Romi Park) who may or may not be a gender-swapped play on legendary Japanese history figure Abe no Seimei. Oozing personality and injecting a great deal of fun into the episode as well as some impressive abilities, based on this episode alone I'd be much more exited if she was actually the star of the show rather than Raikou. Here Seimei proves to be both the brain and the skill to this team, outsmarting the Horror herself (as well as dominating the lower tier ones that appear earlier on) before providing Raikou with that extra boost he needs to transform. While the role of a Makai Priest still seems to be that of support, Seimei feels like the one with the power here. It's a far more interesting (and presumably more permanent) Knight/Priest dynamic than we've seen in other Garo series. The lead cast is rounded off by Kintoki (who so far has offered little more than being a kid sidekick) and as yet unnamed-in-the-show villain, who only makes his debut at the end of the episode. The other interesting thing about The Crimson Moon is that it seems far less straight-faced than the previous Garo anime. Sure The Carved Seal of Flames had Germán's sexually-charged antics, but outside of that there was next to no comedy from any of the other characters. This episode had a whole introduction with characters fawning over Seimei, followed later by our trio of heroes going wild over a bag of sweets. While not necessarily a bad thing, it did feel rather different and more in tune with a more 'anime' sense of humour. While this episode managed to balance the this with the more serious side rather well, the show hasn't really started to wade into particularly serious territory yet. The ultimate test is whether it can handle both when the plot kicks in. MAPPA are once again handling the animation for this series, and although the character design and overall fluidity of the animation seems to have stepped up a notch the CGI looks like it has suffered in the process. Whereas the first Garo anime had the benefit of showing off a brand new variant of the armour to counterbalance it's spotty CGI, this episode doesn't have that luxury. Instead it uses slow, close-up shots of the standard variant everyone is used to by now (even the people who've only seen the first anime, as it was prominently in the second half) - exposing just how badly it gels with the 2D animation sequences. However the effects used for Seimei's spells and the 'cage' she creates for Raikou to fight the Horror aren't quite as distracting, which gives me hope that this might just be a one off and the CGI armour might look better in speedier fight sequences. Based solely on their premieres The Crimson Moon probably has a stronger opener than The Carved Seal of Flames, but seems to be running exactly the same risk as it's predecessor - the setting is so typically "historical fantasy anime" that Garo is going to need to pull out something truly unique to set it apart from the myriad of similar shows available. Hopefully pushing the female lead much further into the forefront is one way they can do this, since Seimei was the one basically carrying this episode. But hey, the first anime managed to turn things around nicely at the halfway mark so there's plenty of hope for The Crimson Moon yet - however let's just hope it doesn't take that long to do so.